This striking chest exemplifies crisp contemporary style with five stacked drawers and a gleaming silver-tone knobs standing out against a deep black finish . The top drawer is lightly ridged and accented with a hooked drawer pull, adding visual balance and variety. All drawers are sturdily built with English Dovetail construction in the front and French Dovetail in the back. 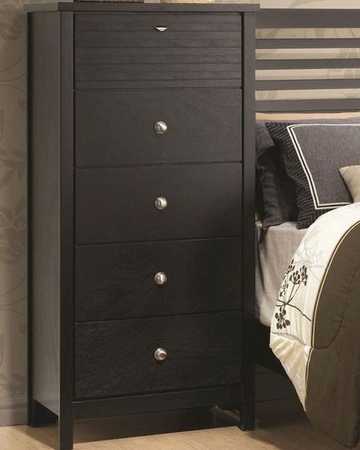 Use this versatile chest on its own or place one at either side of a headboard for a stylish pier bed look.